In the days before plastic containers, the “trug”, a wooden basket, was the common way of carrying and measuring. They came in every size, from tiny up to a bushel. Although they were found all over the country, nowadays they are particularly associated with Sussex and Thomas Smith of Herstmonceux who “reinvented” this ancient style of basket in the 1820s using local materials. Queen Victoria made the distinctive, shallow garden baskets we are familiar with fashionable when she bought some at the Great Exhibition of 1851. 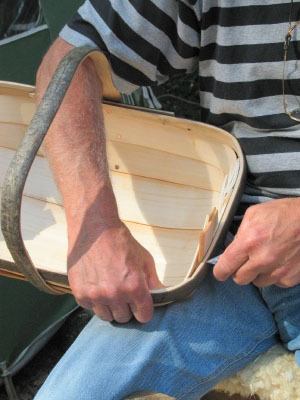 Making a trug involves traditional woodworking skills. The handle and rim pieces are split from sweet chestnut using a cleaving axe (or froe). Held in a shaving horse (a kind of wooden-framed vice), the pieces are smoothed with a drawknife and then steamed and shaped around a former. 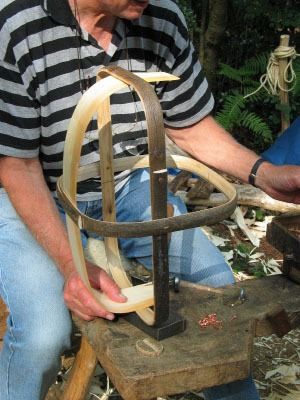 The handle and rim are set at right angles to each other and nailed into place to make the framework of the basket. The boards for the body of the basket are cut from willow (sometimes off-cuts from cricket bat willow). The thin boards are shaped and slightly tapered at the ends and then soaked in water or steamed to make them pliable. Then, like a clinker-built boat, the boards are overlapped and nailed into place in the frame. The result is a very strong and durable basket. The final touch is some feet nailed in place on the bottom. It is a clever bit of practical, traditional design that is also very pleasing to the eye. You will often see them for sale at Wood Fairs, but there are courses available which will teach you the skills if you would like to have a go at making your own trug. I actually run Thomas Smith’s Trug Shop and have done so for over 25 years now and would like to say that the term Sussex Trug is perfectly correct. Prior to Thomas Smith making his light weight Trug it’s predecessor from Anglo Saxon times until the mid 1600’s was a solid wooden vessel hewn from a single piece of timber and had handles underneath. The Anglo-Saxon word “trog” meant “boat shaped” and is assumed to have referred to the coracle. After about 1650 they disappeared from farms in Sussex (in the 1650’s “a dozen of trogs” were listed in an inventory on a farm near Newhaven and this appears to be the last record of these trogs) and were then replaced by the Sussex Trug invented by Thomas Smith at Hormes House, Windmill Hill, Herstmonceux, Sussex! I still make the real Sussex Trugs in Magham Down, Herstmonceux. Whilst it is perfectly true that Trugs were made from Kent (where they were made in the woods by bodgers and are still often referred to as “Bodges”) all the way down to Somerset, this was only after Smith made them famous by selling some to Queen Victoria (for a history of the Trug see my website http://www.sussextrugs.com/history.html}. It so happens that the European Union Parliament are currently looking at protecting the term “Sussex Trugs” in the same way as agricultural produce such as cheeses and champagne are protected, and I am putting our point forward to one of the south east’s MEP’s Catherine Bearer next month (September 2014) at a meeting at our workshops. I fear Alan’s optimism regarding Trug Makers is mis-placed as all the Trug Makers left are one or two man enterprises and none have any apprentices or seem willing to take any on. Coincidentally most, if not all, of them are ex-employees of mine. I am in the process of establishing a Sussex Trug Heritage Centre here at Magham Down in order to protect and preserve the traditional craft of the making of the Sussex Trug. To this end I have recently taken on two local lads as apprentices and they are embarked upon a three year apprenticeship course. Without someone making some effort then Trug Making is in very real danger of dying out and there really is no room for complacency. I have spent the past 31 years of my life promoting and protecting the Sussex Trug Making Industry and feel that I am in a better position than most to continue to do so, especially as it is my full time occupation. As regards Trug Making courses………I run two a year at the Weald & Downland Open Museum at Singleton, near Chichester in West Sussex and run occasional courses at my workshops and for commercial clients. However, the term “Trug Making Course” is a misnomer as it is impossible to learn how to make a Trug in a day, or even in two days, or even a week! It takes at least two years to learn enough about Trug Making to be proficient in the craft and even then you still keep learning. I really become aggrieved when people try to tell would be students that they learn how to make a Trug in a weekend or less time! I always start my courses by telling my students that, whilst they will make an acceptable Trug in two days under the guidance of their instructors, they will not be qualified Trug Makers and what they do over the two days of the course I expect my staff to do in one and a half hours! Consequently my courses are called “Trug Making Appreciation Courses” and anyone who says different is being less than honest. Sussex Trugs are from Sussex, always have been and (when the EU passes its new law) always will be! It is something that was invented by a man of Sussex, is currently made by Sussex men and women in my workshop and is something about which other Sussex folk can be rightly proud! That’s good to know Alan. I take the point about “Sussex” trugs, but every county’s entitled to be slightly kleptomaniacal when it comes to claiming bits of culture. Nice little article Catherine, I worked at Thomas Smith’s for a while making Trugs. I also offer Trug courses if anyone is interested. Hurdle making, Coppicing & Trug making are all still practiced by a number of craftsman Sussexite, so no need to worry about the skills been lost…Although we really shouldn’t call them ‘Sussex’ trugs as they were made in numerous places both before & after Thomas Smith came along. Good to see you highlighting an ancient Sussex skill that is holding on by the skin of its teeth thanks to a few craftspeople. I’m worried that Sussex trug making might go the same way as hurdlemaking and coppicing as a basic countryside skill that will be lost in fifty years or so.